Most often, your email client will automatically set secure port values for you. However, if your client makes you enter these port values manually, view the information below to determine the correct values. Follow the steps below to choose which protocol and port numbers you'd like to use to connect to your mail server. POP3 and IMAP are two different ways of checking mail. A mail client program connects to the mail server using either POP3 or IMAP. 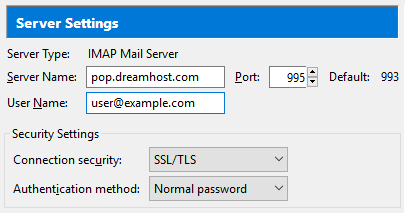 All DreamHost mail accounts support both POP3 and IMAP connections automatically. POP3 downloads all mail from the server from the Inbox and stores it on your computer. This way, emails are available when you're not connected to the Internet. You also have the option (in your mail client) to keep email on the server. If you choose not to enable this setting in your mail client, the emails are removed from the server and only stored locally in your mail client program. The POP setup will only download mail from the Inbox folder. Any other emails in folders or sub-folders (such as Trash, Draft, and Sent) must be moved to the Inbox in order for that to be viewed or downloaded via POP. IMAP syncs your mail client program with the server. Emails stay on the server, and you can make and view mail folders on the server in addition to the Inbox. Most mail client program have a feature to initially sync just the email headers, so you can quickly see what emails you have, then download the message body when you want to read the email. Since emails stay on the server, you can see all your emails from any mail client program or device. Webmail uses IMAP. IMAP is the preferred protocol for accessing your mail from various locations as well as through multiple devices. For example, having your email address set up on your home computer, a tablet, and a phone, IMAP centralizes the storage of your emails to your DreamHost mail server; as long as you have an Internet connection, you can connect to your IMAP servers to access your mail from anywhere on any device. IMAP is recommended since email is available from any device you choose to connect with. POP downloads the emails to a specific device so it's possible email could be lost or misplaced. Use IMAP if you want to check email from multiple computers or devices. Use POP3 if you want your email always accessible, even when there's no Internet connection. But, be aware that email will only be available on the device to which you downloaded them. If you have been using IMAP and have some mail stored in folders other than the Inbox, move the emails to the Inbox before using POP3. Based on your decision to use POP or IMAP, choose the corresponding port number below. Once again, secure IMAP is recommended. Simple Mail Transfer Protocol (SMTP) is the de facto standard for outgoing email transmissions across the Internet. Port 587 is a highly recommended alternative port because port 25 is often blocked by ISPs. Make sure to enable STARTTLS when using port 587. When you choose a secure port number, your connection is secured as an SSL/TLS connection. Below are some of the benefits of using a secure port number. Your login information and email messages are sent in encrypted form, so people can't eavesdrop on them. With certificates properly set up, you can check that the IMAP/POP server that you're connecting to is the correct machine (and not an impostor that just wants to steal your password.) The server provides a certificate (public key) which corresponds to a private key on the IMAP/POP server. Once the client knows that the server's public key is authentic, it can validate communications from that server. Secure settings are particularly useful if using public Wi-Fi, which may not be encrypted. Secure settings ensure that people can’t read your email by listening to the network, nor can they (more intrusively) set up a fake email server to capture your emails. Some clients will set the port automatically when you select TLS/SSL, or select TLS/SSL automatically when you select the appropriate port. Other clients will require that you make both selections in order to fully configure SSL for the appropriate service. What is the STARTTLS connection type? Another method uses STARTTLS. The STARTTLS method connects to the regular SMTP/IMAP/POP3 port and then upgrades the connection to TLS by sending a STARTTLS request. Some email clients refer to this as "TLS" and the method of directly using encryption to a different port as "SSL". This distinction is technically incorrect! The following screenshots are from Thunderbird, but the settings are the same for any client. This example shows the ‘contact@example.com’ user being set up as an IMAP user with SSL enabled using Port 993 for incoming mail. 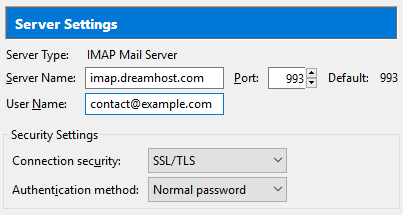 The server name being used is ‘imap.dreamhost.com’ with ‘Authentication’ set to ‘Normal password’. Make sure to use your correct mail server name. This example shows the ‘user@example.com’ user being set up as an POP user with SSL enabled using Port 995 for incoming mail. The server name being used is ‘pop.dreamhost.com’ with ‘Authentication’ set to ‘Normal password’. Make sure to use your correct mail server name. This setup shows the SMTP settings with SSL enabled for the ‘contact@example.com’ email address. The user is set to use Port 465 with SSL for secure connections and the ‘Authentication’ is set here as ‘Normal password’. 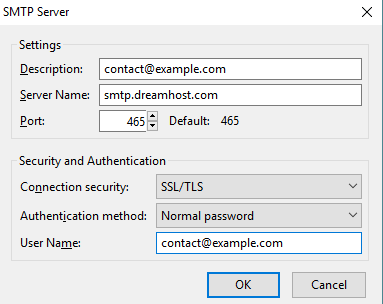 The outgoing server name being used is ‘smtp.dreamhost.com’ with ‘Authentication’ set to ‘Normal password’. Make sure to use your correct mail server name. The port setting and the SSL option must match each other – i.e., if you’re using SSL/TLS you must use secure ports. Enabling SSL (Secure Transport) will require an additional step in confirming and accepting the certificate for the secure connection for both incoming and outgoing mail. It's normal to get a certificate warning when attempting to connect using a secure connection. View the Certificate Domain Mismatch Error article for solutions. Article last updated April 23, 2019 23:27 PST.